The H+-gated (proton) currents are widely present in brain sensory neuronal system and various studies identified the structural units and deciphered the physiological and pathological function of ion channels. The normal neuron requires an optimal pH to carry out its functions. In acidosis, the ASICs (Acid-sensing Ion Channels) are activated in both the CNS (central nervous system) and PNS (peripheral nervous system). 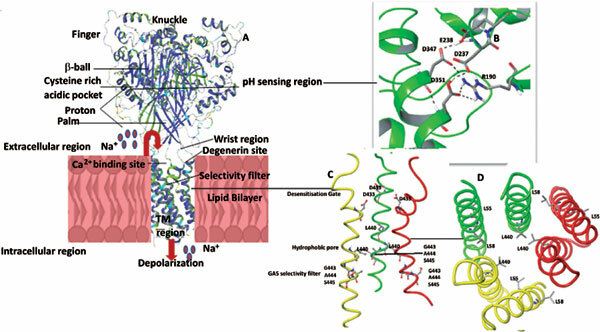 ASICs are related to degenerin channels (DEGs), epithelial sodium cation channels (ENaCs), and FMRF-amide (Phe-Met-Arg-Phe-NH2)-gated channels (FaNaC). Its activation leads physiologically to pain perception, synaptic plasticity, learning and memory, fear, ischemic neuronal injury, seizure termination, neuronal degeneration, and mechanosensation. It detects the level of acid fluctuation in the extracellular environment and responds to acidic pH by increasing the rate of membrane depolarization. It conducts cations like Na+ (Sodium) and Ca2+ (Calcium) ions across the membrane upon protonation. The ASICs subtypes are characterized by differing biophysical properties and pH sensitivities. The subtype ASIC1 is involved in various CNS diseases and therefore focusing on its specific functional properties will guide in drug design methods. The review highlights the cASIC1 (Chicken ASIC1) crystal structures, involvement in physiological environment and limitations of currently available inhibitors. In addition, it details the mutational data available to design an inhibitor against hASIC1 (Human ASIC1). Acid- sensing ion channels, human ASIC1, hASIC1 inhibitor, hASIC1 mutation, H+-gated (proton), CNS diseases.